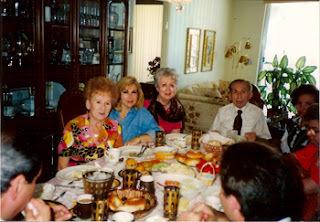 Regina (or Rifka) Korenstein, her daughter Sofia Grobler, ?, William (or Welwel) Socherman, his 2nd wife Clara, Mrs. Diatlo, can't tell who the men are but I think the one sitting across from Welwel Socherman whose right profile can be seen is Sergio Grobler. My guess is this is The Grobler's home in Miami or Miami Beach. Btw, the other gentleman looks like it could be Jay Grobler (Sergio and Sofia's son. Thank you for all the ID's! It is so nice to know who is in the photo. I thought it might be in Miami.